Chinese Foreign Minister Wang Yi has told his counterparts at the ASEAN Regional Forum (ARF) Foreign Ministers Meeting in Nay Pyi Taw, Myanmar that together they are able to ensure peace and stability in the South China Sea and the region. Wang Yi on Sunday said that full and effective implementation of the Declaration on the Conduct of Parties in the South China Sea (DOC) and Code of Conduct are a dual-track solution to regional and maritime stability. The Parties concerned undertake to resolve their territorial and jurisdictional disputes by peaceful means, without resorting to the threat or use of force, through friendly consultations and negotiations by sovereign states directly concerned, in accordance with universally recognized principles of international law, including the 1982 UN Convention on the Law of the Sea. The DOC also calls for the adoption of a Code ofCconduct in the South China Sea which would help to avoid any maritime conflicts in the region. 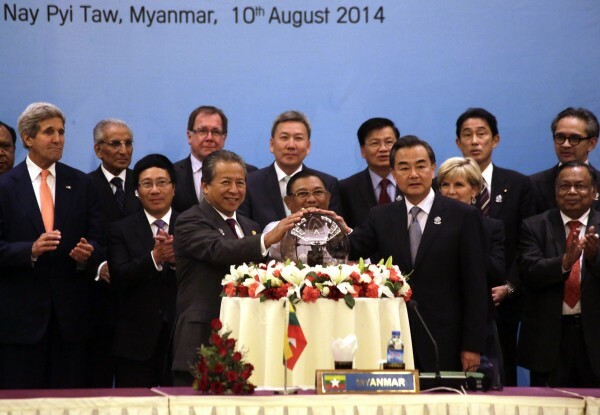 China and ASEAN concluded the DOC in 2002 and have been pushing for efforts to start talks on a Code of Conduct. In early May, a number of Chinese nationals were killed and wounded in violence in Vietnam as ties between the two countries deteriorated over a territorial dispute in the South China Sea. The dispute flared when China moved an oil rig into an area claimed by Vietnam. Vietnam’s Prime Minister, Nguyen Tan Dung, had previously told ASEAN leaders that Beijing was “endangering peace and stability” in the region. “This extremely dangerous action has been directly endangering peace, stability, security, and marine safety,” Dung said. A statement issued by the ASEAN foreign ministers in May said that China and Vietnam must abide by the provisions of the 1982 UN Convention on the Law of the Sea (UNCLOS). They also urged self-restraint and for both countries to refrain from further escalating tensions. The crisis ended when China moved the rig out of the disputed area. Meanwhile, China on Sunday rejected a Philippine proposal to suspend all activity that Manila says escalates tensions between countries claiming the disputed maritime territory. China said it is willing to listen to suggestions from its maritime neighbors but did not want to impede development in the South China Sea. The Chinese government had announced in January new rules requiring foreign fishing vessels to seek Beijing’s permission to operate in some parts of the South China Sea. A Chinese Foreign Ministry spokesperson clarified that the rules are “routine for an ocean state” amid uproar from both Vietnam and the Philippines and increasing intervention from Washington. US State Department spokeswoman Jen Psaki said at the time South China Sea fishing rules are “provocative and potentially dangerous”. On Sunday, Philippine Foreign Minister Albert Del Rosario told Bloomberg News that “tensions in the South China Sea have worsened in the past few months and continue to deteriorate”. Wang responded by telling journalists covering the ASEAN conference that “the position of China to safeguard its own sovereignty, maritime rights and interests is firm and unshakeable”. US Secretary of State John Kerry, who is also attending the ASEAN conference, was in favor of the Philippine proposal, and said that he agreed with his counterparts on the importance of negotiations on a binding Code of Conduct. “And I stressed the importance of everybody clarifying claims under international law and proceeding under the legal process through the law, through arbitration, and also through bilateral relationships,” Kerry said. ASEAN, we are family. Why do we need the America to bullied every small nation to do what they want? If we really need protection, I believe China is a likely choice. They are nearby and most of all does not have the BIG BULLY. attitudes.